This legendary WWII drama about an attempted escape from a German POW camp is Hollywood entertainment at its best. Epic, tense and exciting, and also at times funny, this classic always delivers. Directed by John Sturges, this film boasts an all-star cast which includes Steve McQueen, James Coburn, Richard Attenborough, Charles Bronson, Donald Pleasence and James Garner. 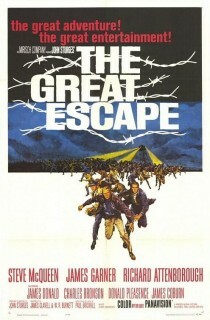 A perennial Christmas TV favorite, The Great Escape is a joy to watch for the first time and on subsequent revisits. The book by Paul Brickill is well worth reading. He was one of the prisoners at the camp and was involved in the construction of the tunnels. The theme tune is one of the most inspiring and if you can’t whistle, then the theme tune is a good place to start. Classic. Also agree, read the book if you can. Thanks for the follow Shimky. Is that a ‘Harvey’ reference, or a bit more ‘Donnie Darko’? Nice blog, and I will be interested to see if our reviews are similar, or we have a ‘clash’ of opinion! Regards, Pete, Norfolk. Very entertaining picture, heart warming too, guys working together. Note final scene , the camp commandant being taken away by the gestapo. As much a victim of the nazis as the prisoners. A shocking ending to a relatively light-hearted film.